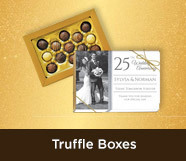 It takes a special kind of commitment to reach a wedding anniversary - and you can can celebrate this achievement with our range of fabulous Wedding Anniversary Chocolates. We can match a chocolate to any traditional theme no matter what anniversary you are celebrating, be it your 1st (Paper Anniversary), 15th (Crystal Anniversary) or 30th (Pearl Anniversary). We have a chocolate for every size party and budget, including both regular and large chocolate bars, giant chocolate freckles, lollipops, mini chocolates and more. All of our delicious chocolates can be quickly dispatched to almost anywhere in Australia and NZ. Feel free to add photos and other personal messages when you place your order.